For the next couple weeks on Instagram, check @thefeedfeed and #feedfeed for inspiration and post images of food you make or have made and add the following text in the original caption, “Inspired by @thefeedfeed #feedfeed”. If you want to include an old post, please repost it with the above text in the main caption to ensure we see it. Your submissions can be a loose interpretation of an idea you gained from the feedfeed community (@thefeedfeed and #feedfeed) which inspired you to make something of your own. For instance, got inspired to braise something after seeing a post on our feed? Made overnight oats for the first time? Added pistachios to pancakes? Made a pear and blue cheese pizza? Sprinkled sumac on top of your eggs? Dried flowers for tea? Added vermouth to your homemade miso soup? 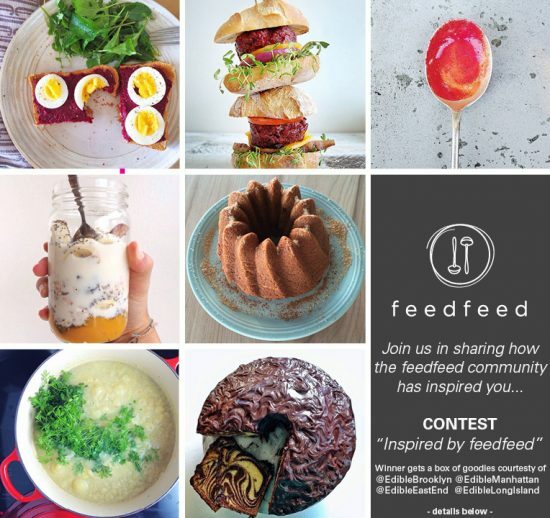 These are just a few examples of Feedfeed founder Julie Resnick has been inspired by people who share on #feedfeed which we share on @thefeedfeed in conjunction with the food we cook on our own. Contest begins today and runs until Saturday May 3 at 11:59 pm EST. We will re-gram our favorite posts/stories of people inspiring each other to cook creatively (via @thefeedfeed and #feedfeed) and the winner will be announced Monday May 5! Please make sure to add “Inspired by @thefeedfeed and #feedfeed” in your original caption of your post to make sure we see your submission. Farm Stand Collab: What’s Cooking Good Looking?